I would like to wish you and your family a safe and very merry Christmas season! 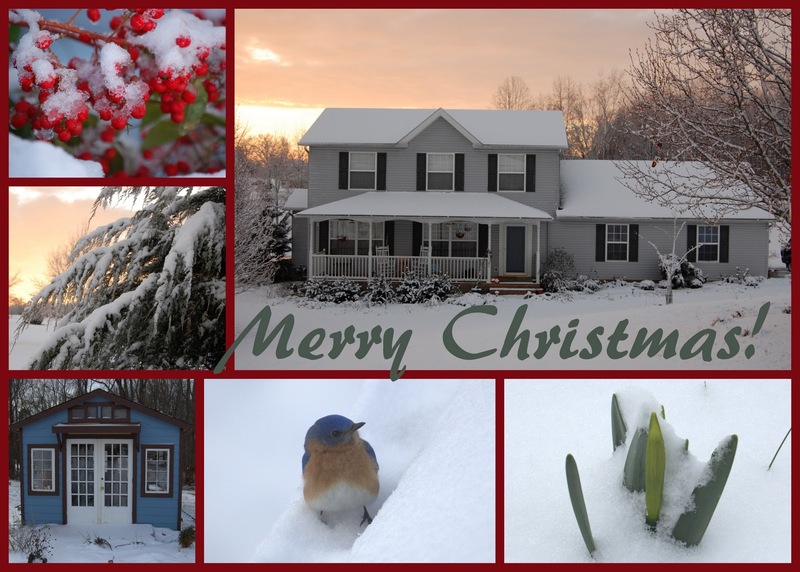 Nandina berries (top left), eastern red cedar under snow(middle left), blue garden shed (bottom left), happy little bluebird in snow (middle bottom), daffodil coming up in a March snow (bottom right), Our Snow covered house (top right). Coming up after Christmas: 2011 Project Review and 2012 Garden Project Lists! Dave, have a wonderful Christmas with your family. I am already thinking of the new year and ordering some seeds to begin under lights. Beautiful card! May you enjoy a wonderful, memory-making Christmas, Dave!! It'll be fun to continue watching all your activity during 2012. What a beautiful card! Happy Holidays to you all!